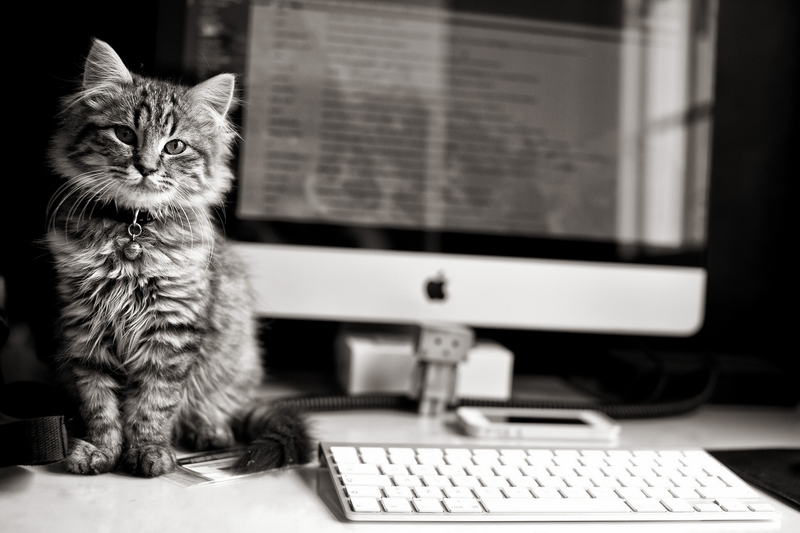 If only I were this adorable when using my Mac. In the last two weeks I’ve noticed several writers either writing new posts about how they decide where to end a chapter, or re-posting a link to an older blog post where they’ve already talked about that. From which I infer that someone somewhere asked about how writers decide where to end chapters and they’re all responding to it. I originally started this post quite a while back, and never got around to finishing it. Seems like now would be a good time to pick it back up! Whether you write your story in order or more free form, there is usually some form of modularity within the story. A very short story may consist of a single scene, but longer stories are usually broken up into multiple scenes, groups of which may be gathered into chapters (or acts), and so on. These modules of narrative provide a means of packaging bits of your story into digestible chunks. How you structure them controls the rhythm of the story, providing a sense of movement through time and or space. And they can be tricky. So let’s start with some definitions. These aren’t necessarily authoritative definitions. You’ll find a lot of writers with similar but still different definitions of these things. These aren’t the only purposes scenes can fulfill. It can be argued that some of the purposes I have listed are subsets of others. Creating atmosphere could be thought of as a specific type of establishing the setting and problems facing the characters in it. I’ve seen other lists of possible purposes for scenes include as separate items things with which, to me, are simply subsets of the ones above. For instance, a lot of people list building sympathy or antipathy for a character as a separate purpose, whereas I think of that as just one type of establishing or developing the character. But those are quibbling details. The important thing to remember is: a scene shouldn’t be in your story if it doesn’t serve one of the purposes for furthering the story. I like to write scenes from a particular viewpoint character. Most of my stories are written in third-person subjective. That means I look at the scene from a particular character’s perspective. I’ll tell you what that person sees, hears, and feels, but without getting into the head of any of the other characters in that scene. So that means that if I need to get into another character’s head, I need to have a separate scene for the character. A chapter is harder to define. Chapters are, largely, the result of tradition, rather than having a clearly defined purpose in a story. The usual explanation is that chapters were invented when scrolls were replaced by books. A single bound book would contain stories, records, or other information that had been in a scroll. The pages which represented a single scroll would be demarked as a chapter. During the 19th century, when many novels were serialized in magazines before being gathered into a book (if at all), chapters were often the monthly or weekly installment of the story. So, one answer to why books have chapters is because people expect books to have chapters. They don’t always, of course. Terry Pratchett’s Discworld books, for instance, seldom have chapters. There are breaks between scenes, but no marked chapters. If a book has chapters, one of the purposes they fill is to break the story into bite-sized chunks. They can provide breaking points where your reader knows she can set the story down and come back easily. Of course, one of the secrets of an enthralling book is chapter endings that entice the reader to keep going, so you don’t want the break to feel like a finale. Chapters can help organize the story in ways other than “this happened, then this, then this…” If your characters aren’t all in the same place, you can use a chapter to gather all of the scenes which happen at the same (or nearly the same) time but with different characters. Or you can gather a bunch of scenes which have some thematic parallels (though if they are happening at very different times, you may have to take extra pains to communicate to the reader when each scene occurs). I like to think of chapters as episodes in a serial story. If my book were a television show, for instance, with each season having an overarching plot, each chapter would represent a single episode of the series. So each scene is an incident, then each chapter is a collection of related incidents. For me, a chapter needs to convey something that feels like a satisfying episode. Which doesn’t necessarily mean it tells a complete story, but when the reader reaches the end of a chapter, it should feel as if they have completely an important step in the journey, with a clear feeling that there is more journey ahead. People often, therefore, recommend ending chapters on cliffhangers. And I agree with the sentiment, but dislike the terminology. Don’t get me wrong, I end plenty of chapters on cliffhangers. But the term cliffhanger is often interpreted to mean that one or more of your characters are in physical peril, and not everyone’s story has a lot of moments where characters finds themselves looking down the barrel of an unexpected gun. Cliffhanger can be any form of unresolved character tension. If one of your characters is being question by the police, most of the scene can be revealing the character’s personality while revealing various details about the situation, and a perfectly acceptable cliffhanger is for the interrogator to reveal a piece of damning evidence that ties the character to the scene of a crime. Even better if the character thought they were being questioned about a robbery, and the revelation is that there is also a dead body at the scene–you’ve raised the stakes to murder! Any situation that makes the reader asked, “Oh, no! How’s he/she going to deal with this?” can be your chapter ending. You don’t have to end the chapter at each moment that evokes that curiosity, of course. Sometimes I have a bunch of cliffhangers within a single chapter. In a fantasy novel I’m working on right now, there’s a battle in which a dragon and her ally (a witch) attack a carriage carrying three monks and a runaway prince. I depict the battle in a number of scenes, each from the point of view of a different person involved in the battle. Each scene in the story ends at a moment where the viewpoint character has just tried to do something, or finds themself confronted with something unexpected. Then I move to a different character and show what’s happening from that viewpoint. You can do this with the other sorts of cliffhangers, too. If your chapter is a collection of scenes happening at nearly the same to characters who are in different locations, you might end each scene with that character making a discovery or realization that gives them pause. I tend to be a seat of my pants writer in so far as I seldom write up a formal outline until I’m in a revision stage. But I usually have an idea when I start a new chapter which incidents I want the cover next. I also tend to make the chapters close to the same length. So sometimes if I notice the word count is getting higher than I thought in a scene, I’ll decide to move one of the scenes into the next chapter… which means I’ll have to think about how to make the scenes that share the next chapter feel as if they belong together. I don’t always make chapters exactly the same length. In one of my current projects, for various dramatic reasons, I have one chapter that is a single sentence, and another that is only eight sentences. This is a rather long rambly way to get back to my original answer: I end chapters when they end. Thanks for the tips…always looking.